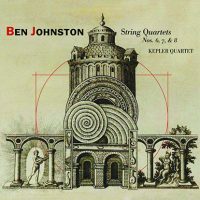 Ben JOHNSTON: String Quartet No. 6 (1980); String Quartet No. 7 (1984); String Quartet No. 8 (1986); Quietness (1996)*. Kepler Quartet: Sharan Leventhal, Eric Segnitz (vln), Brek Renzelman (vla), Karl Lavine (vlc), Ben Johnston* (voice). New World Records 80730-2 (1 CD) (http://www.newworldrecords.org/). Johnston’s ten string quartets constitute one of the most vital yet obscure series in the latter half of the 20th century. That they are infrequently performed and recorded has to do with their difficulty: After No. 1 (1951), the remaining nine require a precise adherence to just intonation or other less familiar tuning systems. This release, the third and final, caps a project begun more than 14 years ago when the Kepler Quartet decided to learn and record all ten with Johnston’s guidance. This is an essential series and we should sincerely appreciate the Kepler’s achievement. There is far more here than just strange notes and chords. Johnston easily embeds folk tunes, sometimes obviously as in No. 4, a series of variations on Amazing Grace, or elusively, as in No. 5 which contains Lonesome Valley, or No. 10 which suddenly arrives at Danny Boy. Johnston’s skilled quartet writing harkens back to late Beethoven, and other than the unusual harmonies, the knottiness demonstrates kinship with Ives and Carter. It does not take long for the ear to acclimatize to the different pitches. Quartet No. 6 combines 12-tone technique with just intonation. There are 61 unique pitches in each octave. The notes explain the single movement’s intricate mixture of overtones, undertones and partials. Each instrument takes an accompanied solo in a different meter. Eventually the music plays back in retrograde, but because the pulse had been gradually increasing all along, the palindrome’s reversal is faster. The Seventh quartet has been labeled the hardest of all because of its pitch scheme and structure. Two short movements, Prelude and Palindromes, are followed by the lengthy Variations. Full ensemble tremolo emerges from the Prelude’s ether in a way best described as crabby because of the narrow intervallic ranges. A tonal cadence deceives before concluding glissandos. In Palindromes, Johnston uses serial structures to present more crabbed material: Each player takes turns at a ghostly tremolo line evenly sliced with plucked chords. The Seventh’s conclusion expands where the prior two movements seemed to constrict. There is an underlying 176-pitch row that never repeats, and because of the continually climbing microtonal anchor, Johnston has 1200 different pitches to choose from. These Variations concern how bits and pieces may repeat in different combinations, and even on first hearing there are many lovely though eerie motives and accompaniments that reappear with subtle transformations. The Eighth offers many of the sparkling rhythms and snappy gestures we had heard in the Tenth on the Kepler’s previous installment (New World Records 80693 with Nos. 1, 5 and 10; Nos. 2, 3, 4 and 9 are on New World Records 80637). Quartets Nos. 8, 9 and 10 are generally more relaxed and tuneful compared to the structurally difficult preceding works. Its forms are more traditional, there are singable tunes, and the microtonal nuances are delightfully squirmy, especially in the wriggling Scherzo. The chords and notes derived from the harmonic series culminate in the short Finale which loops differently sized repeating patterns. The concluding extra, Quietness, is a two-minute setting of Rumi for string quartet and voice, a memorial to composer Salvatore Martirano. The quartet plays against a recording of Johnston singing (actually it’s more like intoning) the translated poem. 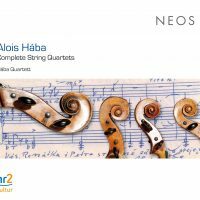 “Complete String Quartets.” Alois HÁBA: String Quartet No. 1, Op. 4 (1919); String Quartet No. 2, Op. 7 (1920); String Quartet No. 3, Op. 12 (1922); String Quartet No. 4, Op. 14 (1922); String Quartet No. 5, Op. 15 (1923); String Quartet No. 6, Op. 70, “Suite in Quarter-Tone System” (1950); String Quartet No. 7, Op. 73 “Christmas” (1950-51); String Quartet No. 8, Op. 76 (1951); String Quartet No. 9, Op. 79 (1952); String Quartet No. 10, Op. 80 (1952); String Quartet No. 11, Op. 87 (1958); String Quartet No. 12, Op. 90 (1959-60); String Quartet No. 13, Op. 92 “Astronaut” (1961); String Quartet No. 14, Op. 94 (1963); String Quartet No. 15, Op. 95 (1964); String Quartet No. 16, Op. 98 (1967); Tagebuchnotizen, Op. 101* (1970); Six Compositions for String Quartet, Op. 37 (1928; arr. Johannes KOTSCHY). Hába Quartet: Sha Katsouris, Hovhannes Mokatsian (vln), Peter Zelienka (vla), Arnold Ilg (vlc); Sigue von Osten* (speaker). Neos 11011-04 (4 CDs) (http://www.neos-music.com/). A quick inventory of the 18 string quartet compositions of Hába (1893-1973): Quartets Nos. 1, 7, 8, 9, 13, 15, and Tagebuchnotizen are in the traditional semi-tone system. There are six quarter-tone quartets: Nos. 2, 3, 4, 6, 12, 14; four in sixth-tone: Nos. 5, 10, 11, and the Six Compositions; and just one quartet, No. 16, in fifth-tone. Hába’s First string quartet was a product of his Viennese studies with Schreker, reflecting the period’s hyper tonality, as well as being his only traditionally designed four-movement quartet. The composer’s experimentation with quarter-tones began in the 1920s: No. 2 presents a chromatic richness and expressiveness that could be a logical extension of Berg. The Third was premiered by Hindemith’s ensemble and declares Hába’s “non-thematic” musical style in which material rarely reappears or undergoes development. Consequently, many of these works offer short movements, except Nos. 4 and 5 which are the longest. No. 5 is Hába’s first sixth-tone quartet (there are 6 pitches in each whole step and 36 tones to the octave), a notion suggested by Busoni. Twenty-seven years after the athematic and freely atonal No. 5, Hába returned to the genre. Nos. 6 through 10, from the 1950s start, are tuneful. To my ear, these quartets are distinctively Czech: No. 6’s dotted rhythms, the Moravian Christmas carols embedded in No. 7’s second movement (which explains its subtitle), and the melody in the subsequent finale. Nos. 7-9, in the traditional semi-tone system, were written in the winter of 1950-51 when the state required optimistic music and less experimentation. It is hard to pick a representative quartet, although No. 10, in sixth-tone, is especially recognizable with its energetic opening viola solo. In No. 11, the composer cleverly hides his name using German musical spelling (H is B-natural, and B is B-flat), except that with the added sixth-tones (the B-natural is raised by a sixth-tone and the B-flat is raised by a third-tone) it is near impossible to catch. Nos. 12 and 13 return to dissonance. Tiny melodic moments in No. 12 suggest Scelsi. No. 13 was inspired by the first Cosmonauts. Nos. 14-16 are multi-part efforts and considerably more abstract than their predecessors. As no material repeats or is developed, these are more like sequences of bagatelles. No. 15 is the shortest at about five minutes. Its fourth movement is an Adagio molto of merely 15 notes, played one after another by different instruments. No. 16, the sole fifth-tone quartet in Hába’s oeuvre (the octave has 31 tones – yes, that’s how the math works), and has eight short movements. The end of the first movement has astonishing microtonal harmony. Founded by violinist Dušan Pandula in 1946, the original Hába Quartet began working with the composer in the late 1940s, eventually premiering the Sixth. However, the heightened socialist state discouraged personality cults of living people, and the quartet was forced to change its name to the Novák Quartet (Vítězslav Novák had been one of Hába’s teachers and a student of Dvořák). The ensemble dissolved in 1968 upon Pandula’s defection to West Germany, but he re-established the group in 1984 with his student Peter Zelienka. We now have two complete traversals of the Czech innovator’s string quartets, including an arrangement of six pieces originally meant for a sixth-tone harmonium built to Hába’s specifications, and a setting of poems by Pandula’s wife, Renáta, meant as thanks for premiering quartets Nos. 6 to 16. They are programmed in the order: 1, 6, 9, 15, 16, and Tagebuchnotizen; 7, 8, 2, 13, and 3; 14, Six Compositions, 10, 11, and 12; 4 and 5. The Stamitz-Quartett achieved all 18 works on five CDs, playing them chronologically (Bayer Records BR 100 282-5 recorded in 1996, and released on CD in 2006). Older releases, probably difficult to find today: The Novák Quartet, Antonín Novák, Dušan Pandula (vln), Josef Podjukl (vla), and Jaroslav Chovanec (vlc), recorded Nos. 11 and 12 in 1963, No. 15 in 1965, and No. 16 live in 1967. These can be found on the three-disc “Alois Hába Centenary,” Supraphon 11 1865-2 913, and they sound fresh and vibrant despite the passing half-century. The Suk Quartet, Antonín Novák, Vojtěch Jouza (vln), Karel Řehák (vla), and Jan Štros (vlc), recorded Nos. 7, 8, 13, 15 and 16 in 1978, which were reissued in 1993 on the Praga line of Le Chant du Monde / Harmonia Mundi as PR 255 005 CM 210. 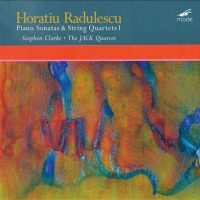 “Piano Sonatas & String Quartets 1.” Horatiu RADULESCU: Piano Sonata No. 2, Op. 82, “being and non-being create each other” (1991); String Quartet No. 5, Op. 89, “before the universe was born” (1990-95); Piano Sonata No. 5, Op. 106, “settle your dust, this is the primal identity” (2003). Stephen Clarke (pno), The JACK Quartet: Ari Streisfeld, Christopher Otto (vln), John Pickford Richards (vla), Kevin McFarland (vlc). mode 290 (1 CD or 1 LP) (http://www.moderecords.com/). Radulescu (1942-2008) combined distinctive ideas about the universe with wonderfully assertive and inventive music. Traditional scales are not enough for this composer, and he explored concurrent and intersecting overtone series in irregular rhythms and patterns. Scelsi and Messiaen are immediate precedents, however Radulescu works more aggressively despite the Taoist influences. In three movements, proportioned per the Fibonacci series, the Second Sonata pries open a cavern with widely spaced chords built from a small cluster of fundamental tones. The composer’s sparse, halting melodies, interrupted by imposing blocks, recall Stravinsky’s primitivism. The Fifth Sonata is austere and vibrantly spectral in its three Fibonacci-proportioned parts. The last movement hides a repeated pitch in a 3 + 2 rhythm, a bit like Ravel’s Le Gibet. The Fifth Quartet demands scordatura for all players and requires frequent harmonics and particular bowing practices in order to untether high overtones. Radulescu’s players must commute between seven different harmonic series. There are 29 pages to the quartet, each about one minute, with descriptive titles meant to prepare the mind, for example: “Do your work, then step back (the only path to serenity),” “We work with being, but non-being is what we use,” and “The DAO will be luminous within you (and you will return to your primal self).” Radulescu’s intentions aside, the energetic music swirls and strives. The quartet has become a colossal 16-stringed instrument set into motion by thought and the slightest breeze. There are harmonic passages that sound like wind chimes or immense doors creaking on infrequently used hinges. In their wisdom, the folks at mode also paired up the Fifth Quartet and Fifth Sonata on LP. The quartet’s first 23 pages are on Side A, the remaining six are on Side B before the sonata. Playing the two formats simultaneously and alternating the signal, I can attest that the LP sound is richer than the CD, exposing more of the quartet’s feathery harmonics and subtle changes of bow on string. Similarly, Radulescu’s repeated piano chords are slightly more distinctive. Regardless of CD or LP, I am glad that this release initiates a planned series.